Port Orange Tree Service is the top tree service company serving Port Orange, FL and the surrounding communities. We perform the widest array of tree services in the area, and always have competitive rates for all of your tree service needs. We can come to your home or business and provide free estimates for any work that you need done, and can help you on an ongoing basis maintain your trees in a professional manner. Sometimes such things as storms, diseases and old age can leave the trees in your yard in a precarious state where they may become a falling danger and need to be removed before this happens. There are also other times that you may simply want some trees removed from your yard to reclaim an area for use or to do something like enhance the view from your home. The arborists at Port Orange Tree Service are experts at removing any unwanted trees, and are also familiar with local codes in Port Orange determining which trees can be removed from your yard and other ordinances that apply to tree removal. Never try to remove a tree on your own, as this can be very dangerous and most people have no idea which way a tree will fall. Once you have taken down a tree you still cannot reclaim that lawn area for use unless you grind the stumps down into the ground far enough so you can plant over them. At Port Orange Tree Service, we have the right tools to do this in a way that once we are done you will be able to use 100% of the area where the tree was once standing. Pruning and trimming are essential parts of keeping the trees in your yard healthy, and to also help the rest of the plants, grass and shrubs in your yard remain healthy too. There needs to be a healthy balance between the area that trees and the other plants, bushes, grasses and shrubs occupy in your yard. Proper trimming and pruning also helps your trees handle the effects of such things as severe weather and wind also. Pruning and trimming must be done in a very specific and technical manner, or you can actually damage your tree. This is why it is best to let the professionals handle this type of work. Unfortunately, many tree service companies do not use tree service techniques in a way recommended by arborists to do the work, or they don't train their employees on the proper way to take care of trees. When this happens, it can leave your trees in an unhealthy condition that will lead to rotting conditions or leave them vulnerable to tree diseases. At Port Orange Tree Service we can come to your home or business and help remedy this situation and get your trees back healthy again. One of the most important services that we provide is emergency tree service. 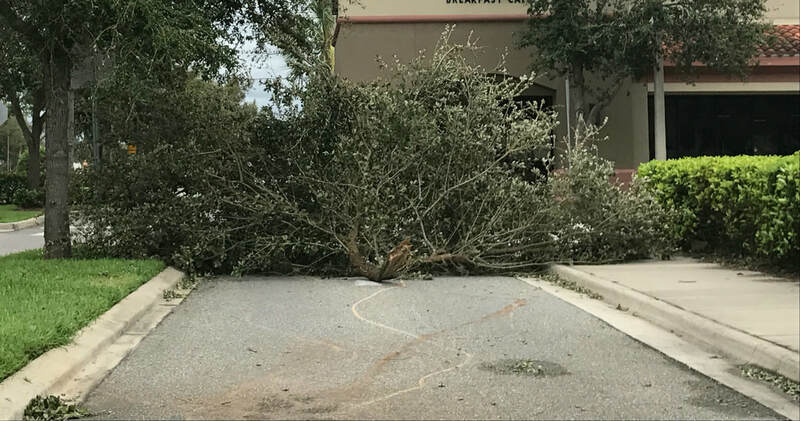 Just like beaches and trees are common in Volusia County, so too are storms and windy days; these can wreak havoc on the trees in your yard to say the least. Many times after storms or periods of high wind it will leave trees down, branches dangling dangerously and all sorts of tree debris all over your yard; when that happens you will most likely need our help, as we specialize in emergency tree services. There is nothing more dangerous after a strong storm than when it leaves tree limbs leaning on or entangled in power lines. This can lead to accidental electrocution by somebody coming into contact with the tree if the limb is still partially attached to the tree, or there is even the possibility that it can start something on fire. If any part of a tree is resting on a power line it must be dealt with right away. At Port Orange Tree Service, our crews are experts at doing this type of job safely. It does not matter whether it is an entire tree leaning on a power line or just a small branch; we have the right tools and knowledge to get the job done quickly and safely. Power lines are not the only places that parts of trees can lean or land on where they do not belong and need to be removed quickly. They can do structural damage when they fall on parts of your home, or block driveways so you cannot use your vehicles, and also be left in positions where they can potentially do more damage or be hazardous to anyone that goes into your yard. Again, in these emergency situations we know how to handle the removal and cleanup to leave the trees in your yard in the best shape possible after severe weather or other incidents that affect the trees in your yard. We've built our business with a focus on putting the customer first. Our priority is always provide the best tree service in the market, and always at an affordable and competitive price. Our aim is to build long-term customer relationships, and always make sure our customers for 100% satisfied with the work that we do in the service we provide. We do not take shortcuts, and we only perform the highest quality work. All of our crews are trained with these priorities in mind on a daily basis. So whether you need routine tree services to preserve the health of the trees in your yard and the aesthetics of your property, or you need emergency tree services; make sure you contact Port Orange Tree Service in Port Orange, FL for all of your tree service needs. We have the right equipment necessary standing by to do the job quickly and in a way that leaves the trees in your yard in the healthiest condition possible. We will even remove the tree debris from the property if you choose for us to do so. So call us today at 386-267-6399 for a free estimate for your home or business tree service needs. Click to learn more about us.